The finishing touches are what will set your event apart from the rest. And it needn't take an event planning agency, or a big budget, to create something totally beautiful. Check out these five ideas for event decorations that you can do yourself and on a budget, that will take your summer party to the next level. Umbrellas are most certainly the object you'd rather not have at a summer party, even with the British weather, but we're using these for something a little bit different. Hanging upside-down umbrellas creates an amazing backdrop for a party. Providing pops of colour and an effortless way to make large venues or outside spaces more intimate. Combine with flowers and fairy lights and you've got some showstopping decoration that you've created all by yourself. Probably best known for pickling and jam making, mason jars are actually brilliant to use as event decorations. They are so versatile, you can use them as make-shift lights, centrepieces, candle holders...the list goes on. Fill them with fairylights and shells or candles to light up your evening event or with flowers for an easy centrepiece. They also look great covered in glitter for some added glamour. Again, this couldn't be easier, and it also offers you the chance to spruce up any furniture that may have seen better years. Just find some ribbon that works with the rest of your event's colour scheme, and simply tie around the tops of your chairs. Use strips of different colours and you'll have your guests reminiscing about the seaside and sticks of rocks - what could be better at a summer shindig? 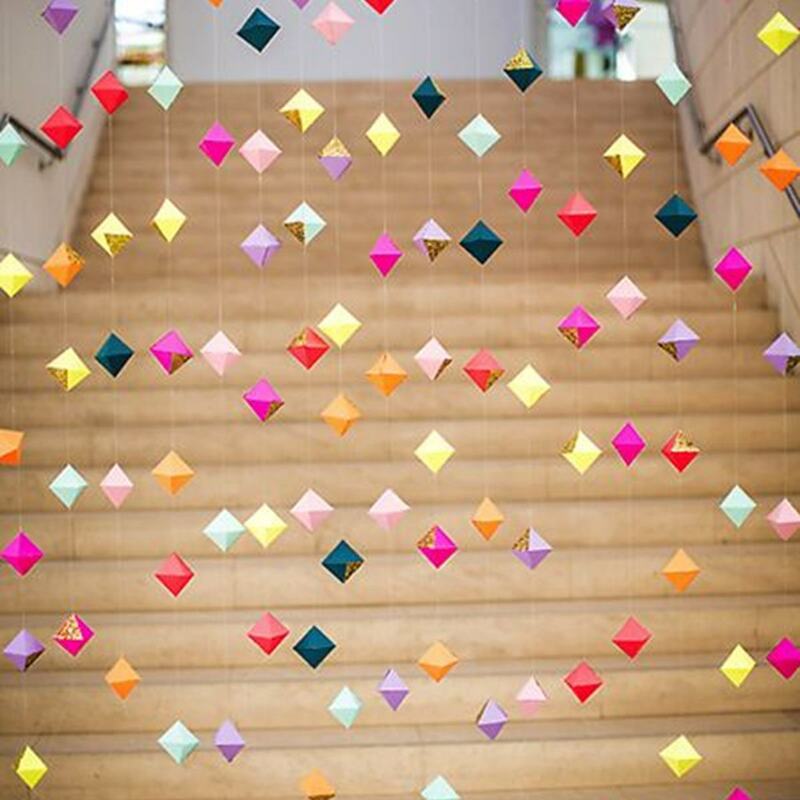 It's a simple, effective, and beautiful way to transform your event space. This one's a little trickier to pull off, but the results can be amazing. Folding these shapes can be fiddly and time-consuming but definitely worth the effort, here's a template if you want to go for it! Alternatively, you could use premade plastic or paper flowers to achieve a similar effect. If you're looking to divide up your space or provide a backdrop for photos, this is a beautiful and elegant way to do it. Everybody loves Champagne and strawberries and these popsicles provide a brilliant twist on a classic. They're easy to make at home, you can use Prosecco or Cava to help keep you within budget and most of all they are delicious. Perfect for keeping your guests cool on a hot summers day, these popcisles can also be laid out on ice with fresh fruit for a display that'll get everyone talking.